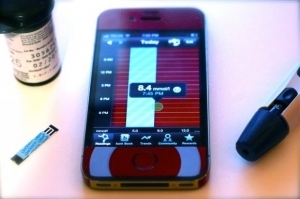 As discussed in part 1, in our development of a next-generation remote patient monitoring system, we elected to develop a chronic disease remote monitoring system based on a smartphone that would allow the automatic wireless transfer of measurements from medical devices (e.g. weight scales, blood pressure monitors, glucometers, etc.). There is little compromise in electing to use mobile phones over purpose-built hardware, as mobile phones typically have greater computational power than these platforms, as well as built-in broadband Internet access. This gives us the ability to scale the system to reach many more patients than would normally be possible on systems based on purpose-built hardware that cost significantly more to produce. Although we take the design and development of this smartphone platform very seriously, we aren’t interested in creating gadgets. As a research hospital, we take the opportunity cost of building such a system seriously. We need real tangible results. Hence, we spend more time and money evaluating the technologies that we develop than on building them. Our findings feed the next iteration of the technology. This is an example of evidence-based design. Consider it user-centered design on steroids. Read below to see how this worked when we targeted the hardest group of all: kids. Specifically, adolescent kids. These are the kids that are learning independence, that are leaving the house more often, that aren’t eating right, or listening to their nagging parents. Now imagine them with a chronic illness such as diabetes. These kids are notorious for taking fewer and fewer blood glucose readings per day, eating improperly, and generally having a defiant streak in them. So how is our system going to help these kids? Well it’s not. Reminders and phone calls are just automated versions of their nagging parents. We needed to start again. They would get a times two multiplier (x2!) when they took consecutive readings (like that elusive lunch reading at school). Once they leveled up, the app gave them a reward in the only way we thought possible on the iPhone – through iTunes. They were able to buy apps and music with the points they redeemed. The rewards were quite the hit. Over a three-month period they increased their frequency of measurement by 49.5%. That’s on average an extra reading per day. This was only a pilot of twenty kids, but it was a good start. We learned lots about the mini social community that we integrated into bant too. Kids were able to micro-blog in a private twitter-like community within the app. This engagement was a first for some kids. Many of them have never met another kid with type I diabetes. The purpose of this was to keep them engaged, to provide that “stickiness” that would keep them returning to bant, and not abandon it for Angry Birds instead (although, Angry Birds was a very popular redeemed reward!). Next up for bant – tying rewards to action around blood glucose management directly. We would like to show an actual improvement in A1C, otherwise what’s the point? Of course, an RCT is planned to show if this, in fact, is achievable. I love technology as much as the next person, and am the biggest Apple fan there is. That said, while the results of experiments such as these are promising, in the real world where my patients live in families that have difficulty putting a roof over their head, how can we expect for them to afford devices such as these? In my experience, those are the types of kids that need the most help, not the ones who’s parents could afford a smart phone for their child in the first place. Thanks for your comment Jose. It is true that this technology is relatively expensive, but perhaps not so costly when compared to the total cost of treating type I diabetes. Nonetheless, the purpose of the study was to test our ideas around the use of technology and eliciting positive health behaviours and it was our job to get the price point as low as possible. We also tried using a lower cost iPod Touch instead of the iPhone. The results were the same which is encouraging. We are betting that mobile technology will be even more affordable in the future so that it will be more accessible to those who are underserved. The irony is that studies show the greatest users of techno devices are the very rich and the very poor. Therefore despite their poverty many carry around very high dollar equipment. This factoid makes a rewards program mentioned above very feasable.